Handmade. Rustic. Earthy. Personalized. And soft, dreamy neutrals. This is what a natural wedding feels like--and is the basis for today's "Color Monday" inspiration board. How relaxed is this mood board with all the textures and colors of nature?! 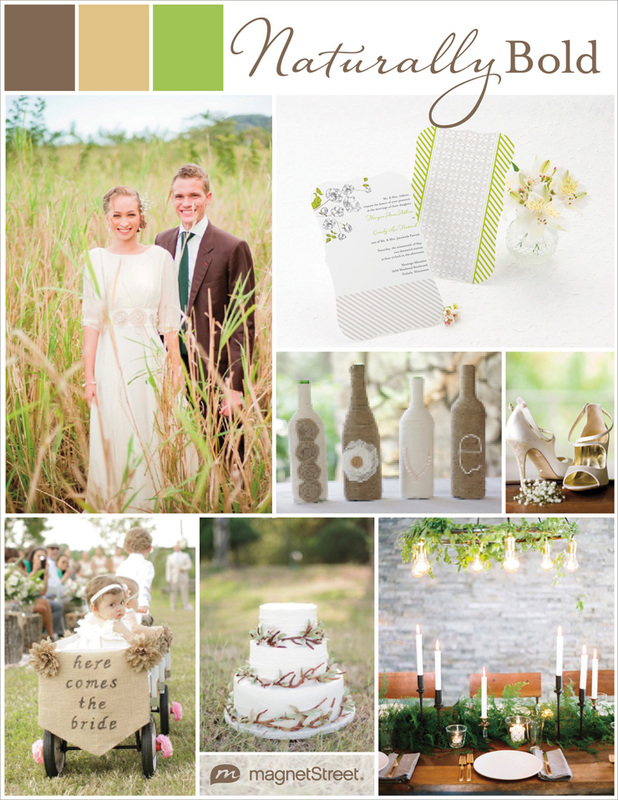 The pop of springtime green adds a fresh touch--perfect for a rustic and romantic natural wedding. Need ideas? Think along the lines of a vintage organic cotton wedding dress, DIY burlap decor and runners, jute-wrapped wine bottles, cascading greenery, fern-embellished centerpieces, and a wedding cake adorned with birch twigs! Oh, and a bracket-shaped wedding invitation to highlight the specifics of your big day. We'd love to hear what your favorite element or color palette is for a spring or summer natural wedding? Featured: Rectangle Wedding Invitation from the Decorative Spring design suite. This bracket-shaped Wedding Invitation belongs to our Decorative Spring design suite. Hand-drawn florals, pretty fonts and diagonal stripes set this stationery suite apart for a romantic spring or summer wedding. The bracket shape of the invite adds a soft, feminine touch that helps define the details for the big day. 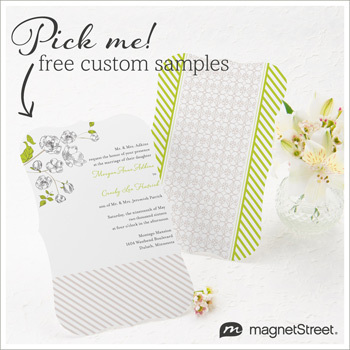 Get a free sample of this bracket-shaped floral invite. Change up the colors to any you wish. See MagnetStreet's new line of Shaped Wedding Invitations. Submitted 3 years 12 months ago by Heidi.